MINNEAPOLIS/ST. PAUL  The 2013 WNBA Champion Minnesota Lynx today announced the teams schedule for the upcoming 2014 season. 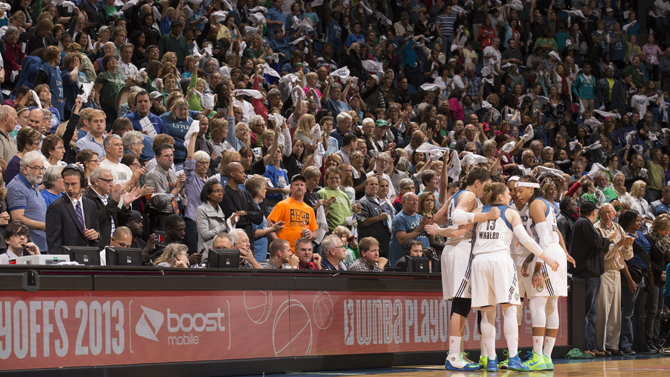 The Lynx will kick off their 16th season in the WNBA on the road at Washington on Friday, May 16 at 7 p.m. The 2014 home opener will be on Sunday, May 18 vs. Connecticut at 4 p.m., which will feature a historic ring ceremony and championship banner raising for the 2013 WNBA Champions. The 2014 WNBA campaign includes 34 regular-season games, dating from May 16 to Aug. 17. This years All-Star Game will be held in Phoenix, Arizona on Saturday, July 19. Full-season memberships, which include tickets to all 17 home games and priority playoff seating, are still available by visiting www.lynxbasketball.com or by calling 612-673-8400. Minnesotas 17-game home schedule includes 10 weekend games (3 Friday, 1 Saturday, 6 Sunday), two Tuesday, two Wednesday and three Thursday games. The teams annual camp day game will tip off on Wednesday, July 16 at 12 p.m., as the Lynx play host to the Tulsa Shock. The Lynx have one four-game homestand this season (July 13  25) to go with one four-game road trip (June 1 13). Highlights of the home half of the schedule include: a rematch of last years WNBA Finals when Angel McCoughtry, Tiffany Hayes and the Atlanta Dream return to Target Center on Tuesday, July 22 at 7 p.m. and a rematch of last years Western Conference Finals with Diana Taurasi, Brittney Griner and the Phoenix Mercury (Sunday, June 15 and Thursday July 31). Minnesotas preseason schedule will be announced at a later date. By month, the schedule breaks down as follows: May (3 home, 3 away = 6 total), June (4 home, 7 away = 11 total), July (7 home, 3 away = 10 total) and August (3 home, 4 away = 7 total). By day, the schedule breaks down as follows: Monday (1 away = 1 total), Tuesday (3 home, 2 away = 5 total), Wednesday (1 home, 1 away = 2 total), Thursday (3 home, 1 away = 4 total), Friday (3 home, 6 away = 9 total), Saturday (1 home, 2 away= 3 total), Sunday (6 home, 4 away = 10 total). Minnesota's 17-game home schedule will feature six different starting times: nine games tipoff at 7:00 p.m.; three games (three Sundays) will commence at 6:00 p.m.; two games (Sunday and Wednesday) will start at 12:00 p.m.; one game (Sunday) will start at 4 p.m.; one game will start at 8 p.m. (Tuesday) and one game will start at 2 p.m. (Sunday). The Lynx will open their regular season slate on the road on Friday, May 16 at Washington, marking the seventh time in franchise history the club has opened the season on the road. Minnesota has one homestand of at least four games this season, a stretch which includes games against Seattle, Tulsa, Atlanta, and San Antonio from July 13  25. The homestand is part of the most home-friendly section of the Lynx schedule, a 12-game stretch between June and July, when the Lynx play nine of 12 games at Target Center (June 20  July 25). The most consecutive road games this season for the Lynx is four: June 1  13 (San Antonio, Seattle, Los Angeles, Atlanta). The Lynx also have two strings of two consecutive road games this summer: June 17 -- 18 (Los Angeles, Phoenix) and Aug. 2 -- 5 (Tulsa, Indiana). Minnesota will play games in back-to-back nights twice this season: at Tulsa May 23 and at home May 24 vs. New York and at Los Angeles (June 17) and Phoenix (June 18). The Lynx will also play the same opponent two games in a row twice in 2014: San Antonio (May 30  June 1), and Seattle (June 27  29). Western Conference: Los Angeles (H: 7/8, 8/12; A: 6/8, 6/17); Phoenix (H: 6/15, 7/31; A: 6/18, 8/9); San Antonio (H: 5/30, 7/3, 7/25; A: 6/1, 8/15:); Seattle (H: 6/29, 7/13; A: 6/6, 6/27 ); Tulsa (H: 7/16, 8/17; A: 5/23, 7/10, 8/2). Eastern Conference: Atlanta (H: 7/22; A: 6/13); Chicago (H: 8/7; A: 5/26); Connecticut (H: 5/18; A: 7/27); Indiana (H: 6/22; A: 8/5); New York (H: 5/24; A: 7/6); Washington (H: 6/20; A: 5/16). Sunday, June 1 at San Antonio 3:30 p.m.
Sunday, June 8 at Los Angeles 12:30 p.m.
Sunday, June 15 PHOENIX* 12 p.m.